Every day we hear the stories and see the pictures. Happier, healthier pets with softer coats, clearer eyes, and increased energy – all from eating fresh, real food. At Freshpet, they love making a difference for dogs and cats – and that difference always begins with the best ingredients. Our families have started to eat better knowing what fresh food does for us so why wouldn’t your pet eat fresh food too? I sure can’t wait to get into this bag of FreshPet cat food. It smells so good. 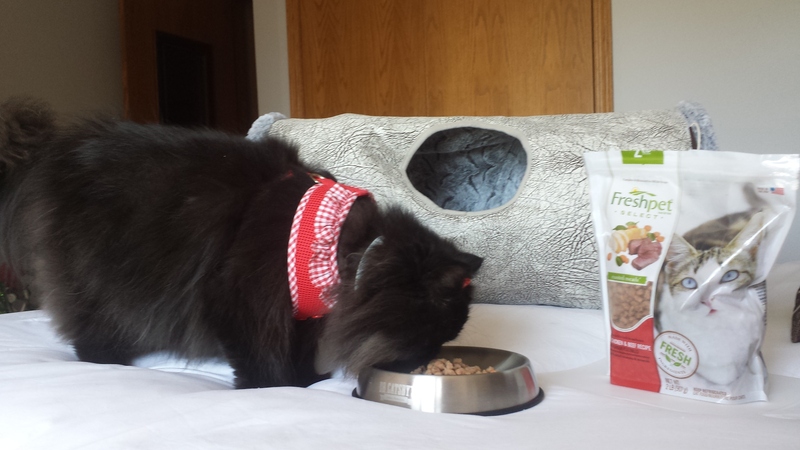 Purr..
Freshpet is packed with vitamins and proteins, their meals offer fresh meats, poultry, and vegetables farmed locally. The Freshpet Kitchens then thoughtfully prepare these natural ingredients and everyday essentials. They cook in small batches at lower temperatures to preserve key nutrients. That way, your pet gets the best nutritional value. You have to store it in the refrigerator to keep it fresh. I have seen a difference in Angel’s coat it is fuller and softer even her energy level has doubled since we have tried Freshpet. She is playing like a kitten again. Angel gets so excited about eating now. Before she would never come to eat Breakfast or dinner we had to find her and bring her meals to her. But now she is coming to us asking for her breakfast or dinners with excitement about eating. Angel has put weight on finally we thought maybe we should take her to the vet because she was loosing weight. 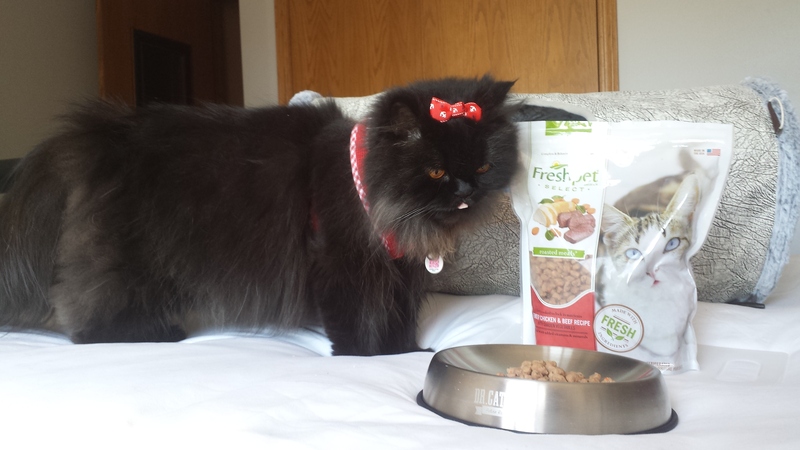 FreshPet has made Angel happy and healthy even fun loving again. Fresh Pet is found across the USA in your grocerie stores. If you would like more information or to find a store near you follow the links below, but don’t forget to leave me a message I would love to hear from you.. 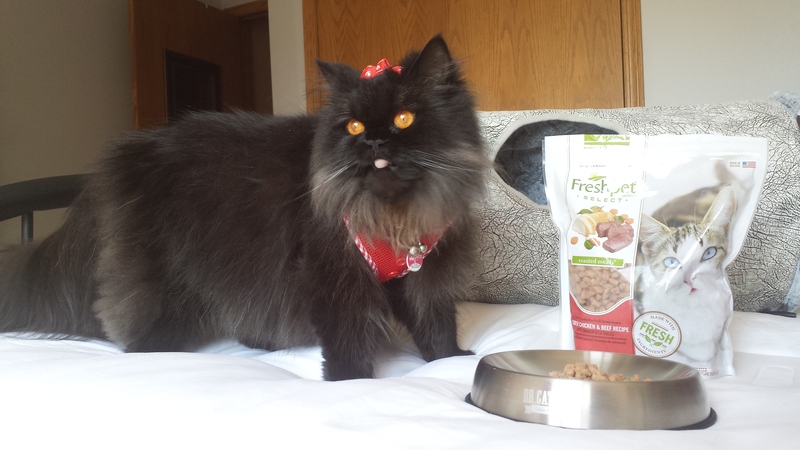 Thank for stopping by and Thank you FreshPet for making me healthy again! This entry was posted in Angel's Eyes, Food, Product Reviews and tagged cat, cats, cute, FreshPet, funny, katze, katzen, kawaii, ねこ, ﾈｺ, 猫. She is just plain gorgeous, and thanks for the information about Fresh Pet, I’ll try that with one of own fussy eaters, Happycat. Sounds like a great food. You are so adorable. I’ve been hunting for better quality food, especially for my senior girls. Just like humans, senior cats don’t digest as well and really need high quality food. I am going to try this. Coat improvement is a great indicator of how well it works, although Angel has always been beautiful. I hope this food cat help with your senior cat they do make quality food.